The Spanish – Canary Islands population data represent DNA samples from 138 Canarian individuals (Canarian people) who descended from at least three generations of Canarii people born on the Island of Gran Canaria (one of the Canary Islands). The group of seven islands off the Atlantic coast of West Africa have long been part of the Kingdom of Spain (Canary Islands). Samples were obtained by the Dept. of Legal Medicine in the Faculty of Medicine at the University of Cadiz in Cadiz, Spain; and by the Institute of Legal Medicine of Coimbra, in Portugal. The Spanish – Canary Islands population data represent DNA samples from 240 Canarian individuals (Canarian people). 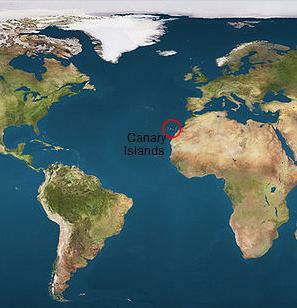 The group of seven islands off the Atlantic coast of West Africa have long been part of the Kingdom of Spain (Canary Islands). Samples were obtained by the National Institute of Toxicology and Forensic Sciences, Canary Islands Delegation, Campus of Health Sciences, (Instituto Nacional de Toxicología y Ciencias Forenses, Delegaciòn de Canarias, Campus de Ciencias de la Salud), in San Cristóbal de La Laguna, Spain, on the island of Tenerife. Research was partly funded by a grant from the Canary Islands’ Advisor of Education and Culture, General Director of Universities and Investigation. (Consejeria de Educacion y Cultura [DGUI], Gobierno de Canarias). Canarians History and Cultural Relations. Source publications: A Study On Ten Short Tandem Repeat Systems: African Immigration And Spanish Population Data, FSI, 2000, p167-177. Allele frequencies of the Profiler Plus STR loci in Canary Islands (Spain)/ Allele frequencies of the Profiler Plus STR loci in Canary Islands (Spain), Progress in Forensic Genetics 9, 2003, p95-103.